AMD is currently preparing their next generation Kaveri APU which would be featured on the high-end desktop PC platform. 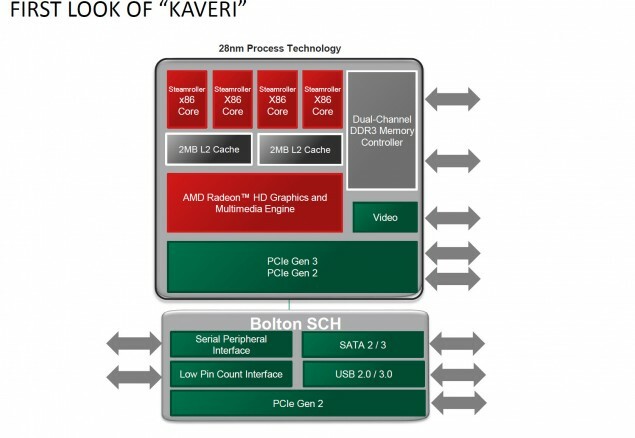 The new Kaveri APU is going to be the company’s first processor to feature their refined Steamroller core architecture based on the 28nm process and thanks to VR-Zone, we have details regarding its features and launch date. Image is courtesy of VR-Zone! Chinese portal of VR-Zone who have acquired the latest slides from the AMD Kaveri APU PDF details that the new processors are going to launch in February 2014. This confirms our previous reports in which we mentioned that the new APU would have been pushed forward to Q1 2014 and possibly February. But we have already seen tons of appearances and entries of the APU in various benchmark portals. The slide mentions that Engineering samples and Production candidate samples have been out since August and October ’13. The Production ready samples are going to appear in early December while full scale production on Kaveri APUs commences in late December. AMD has planned a target launch of February 2014 and we are looking at three SKUs at launch. Two A10 Series and a single A8 series Kaveri APU retail model would be available to consumers by February 2014. Specifications were not mentioned but features of the Kaveri APU have been detailed which include AMD Start Now 3.0, New PCI-e SSD interface (Dedicated x4 interface for SSD or caching) and a new low latency, low power, performance level audio co-processor which will provide high-quality audio management and sounds similar to the TrueAudio technology featured on AMD’s new GPUs. 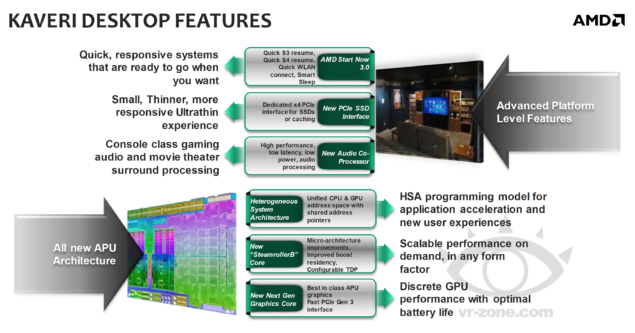 In addition to these, we already know that Kaveri is going to feature HSA (Heterogeneous System Architecture) which would allow coherent memory access between the on-Die GPU and CPU. This new unified access would allow easier programming and faster access to the hardware. Kaveri adopts the SteamrollerB cores (upto 4 cores ) which are a revised version of the Steamroller architecture featuring improved boost residency, configurable TDP and higher clock speeds. Last of all, we would see AMD integrated their discrete level GCN architecture featured inside their Volcanic Islands graphic cards to be fused inside the on-die GPU cores. This would mean that AMD Kaveri supports Mantle API, OpenGL 4.3 and DirectX 11.2 which is amazing for a low price platform like the APUs. Last month, Entries of a 100W Kaveri APU called (KV Spectre Desktop 100W 1305) were spotted on Sisoft Sandra’s benchmark portal along with some specifications regarding the GPU, memory and a few bandwidth tests. The Kaveri APU model showed a total of 13 CUs which amount to 832 Stream processors that is just a CU less than the top HD 7700 series card – Radeon HD 7790 and higher than the Radeon HD 7750 and Radeon HD 7770 (10 CUs/ 640 SPs) which could hint at the performance. The GCN enabled graphics goes by the name of Radeon R5 M200 which was also revealed in the leaked catalyst drivers a while ago and uses a naming scheme which the next generation discrete GPUs from AMD uses R200 series branding and the R5 230 is actually a entry level product in the discrete GPU lineup. For socket, AMD Kaveri APU would be featured support on their latest FM2+ socket motherboards from OEMs such as MSI, ASUS, ASRock, Gigabyte, BioStar and more. The A88X chipset would add support for Kaveri, Richaland and Trinity APUs on the FM2+ socket and would later extend support to Carrizo APU. For full details on Kaveri APU, head over to this article.